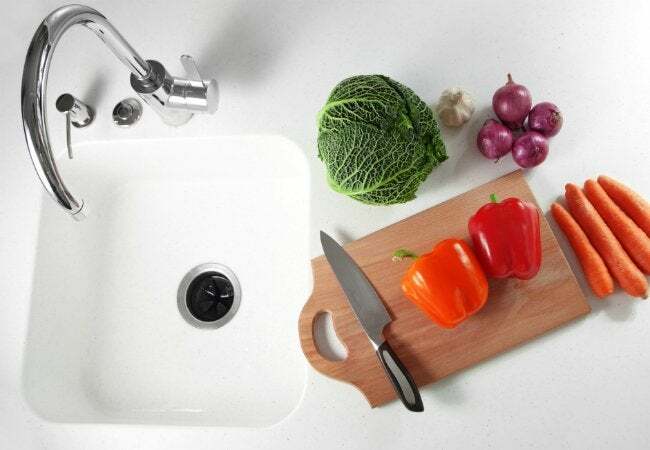 If your sink smells like the dumpster behind a restaurant, take ten minutes to clean out your garbage disposal with these freshening tips. Consider the environment within the average in-sink garbage disposal: It’s cool, dark, and moist, and there’s a near constant influx of food that gets shredded and scattered about. No wonder it gets smelly from time to time! To clean a garbage disposal and eliminate the odor-causing bacteria, follow these instructions. There are two cardinal rules when it comes to cleaning a garbage disposal. The first is always to disconnect the power to the appliance before working on it. The easiest way to cut its power is simply by unplugging it. Normally, it’s plugged in to the wall under the sink. If you can’t locate the outlet, go to the electrical panel in your house and cut electricity to the circuit on which the garbage disposal is powered. To confirm that the power is off, try turning on the garbage disposal. Next, point a flashlight down the drain to identify objects that may be lodged in, or wound around, the impellers that macerate the solids sent through the disposal. Look for such things as bottle caps, aluminum can pull-tabs, or vegetable fibers. If you find any, remove these items with needle-nose pliers or tongs. Yes, the second rule of cleaning a garbage disposal is never to stick your hand into the chamber. Drop about a dozen ice cubes into the garbage disposal, followed by a half-cup of rock salt. Restore power to the disposal, so that you can turn on the mechanism while running water down the drain. Keep it on for about a minute, until all the built-up grime and gunk has fallen away from the disposal blades. Check the drain with a flashlight again. If the blades are clean, go and shut the power back off. Pour a cup of vinegar and a half-cup of baking soda into the disposal. Let the combination fizz for about 15 minutes. In the process, the acidity of the solution kills bacteria, including salmonella and E. coli. Stick with the natural cleaners here; no toxic chemical should be used. Just as bacteria can come flying out of the disposal, compromising the sanitation of your kitchen sink, so too could a chemical. While the vinegar and baking soda are busy fizzing inside the disposal, combine the two again—this time outside the appliance, on the counter—to create a thick paste. Put some of that paste on an old toothbrush, and use it to scrub down the top and bottom surfaces of the rubber flaps along the neck of the disposal. Those flaps are likely to be as bacteria-ridden as any other component. So while you’re at it, think about giving a good scrubbing to the rubber parts on your sink stopper, too, if there are any. Now’s the time to engineer one final flush of the garbage disposal. First, plug the drain opening. Second, run the water in the sink until its basin is about three-quarters full. 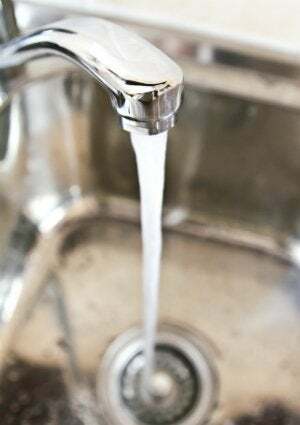 Add a teaspoon of dish soap, then finally remove the drain plug, letting the water drain out all while the disposal runs. You can add a fresh aroma to the sink and disposal by sending citrus peels through the disposal. And in the future, with regular cleaning of the garbage disposal, you can make sure odors stay away. Mark your calendar with a reminder to clean the garbage disposal every two weeks or so. For regular cleaning, any method works, be it ice and rock salt or vinegar and baking soda. Each takes only a few minutes, and if you stay on top things, you can avoid the more laborious and time-consuming process detailed above.